1. Chill a large bowl in the freezer. 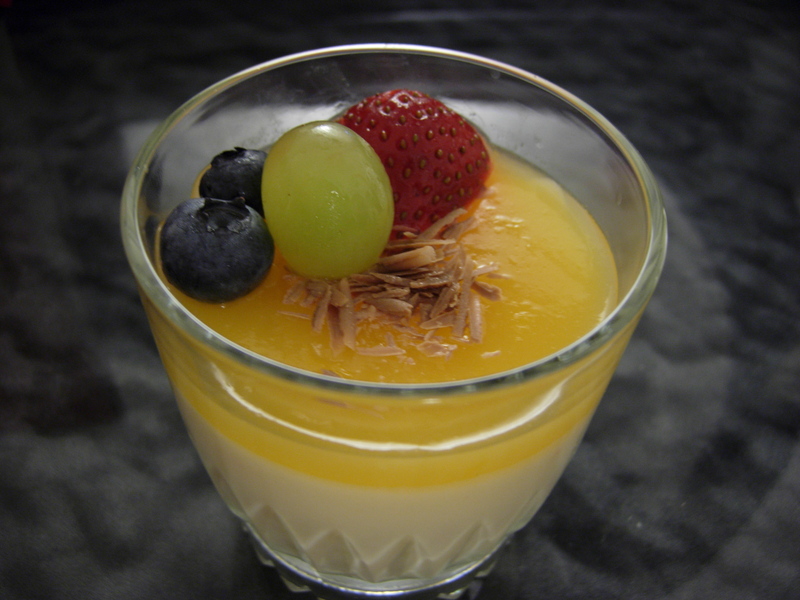 If you plan to unmold the bavarois onto plates, then grease your molds/cups with almond oil or melted butter. Otherwise you don't need to grease the cups. 2. In a small heatproof bowl, pour the tangerine juice and sprinkle the gelatin powder on top. Let sit for 5 minutes until gelatin powder becomes spongy. Boil water in a large pan and remove from heat. Slowly lower the gelatin bowl into the water so that it is half submerged but not touching the bottom of the pan. Stir the gelatin mixture until completely dissolved. Set aside to cool. 3. Stir together the egg yolks/substitute with the powdered sugar. Heat the milk, 3/4 cup of the cream and orange zest in a saucepan until scalded (small bubbles will form). Slowly pour hot milk into the egg and sugar mixture, stirring constantly to prevent the eggs from cooking. At this point I was supposed to return the mixture to cook until it becomes a custard that coats the back of a spoon, but I accidentally added the gelatin solution into it prior to cooking it (you normally add the gelatin after cooking). 5. Whip the remaining 1/2 cup of heavy cream until it forms soft peaks. Gently fold it into the cooled custard. (Because I didn't cool my custard enough, a lot of the volume in the whipped cream disappeared as I incorporated it. The purpose of adding the whipped cream is to increase volume and to lighten up the custard). 6. 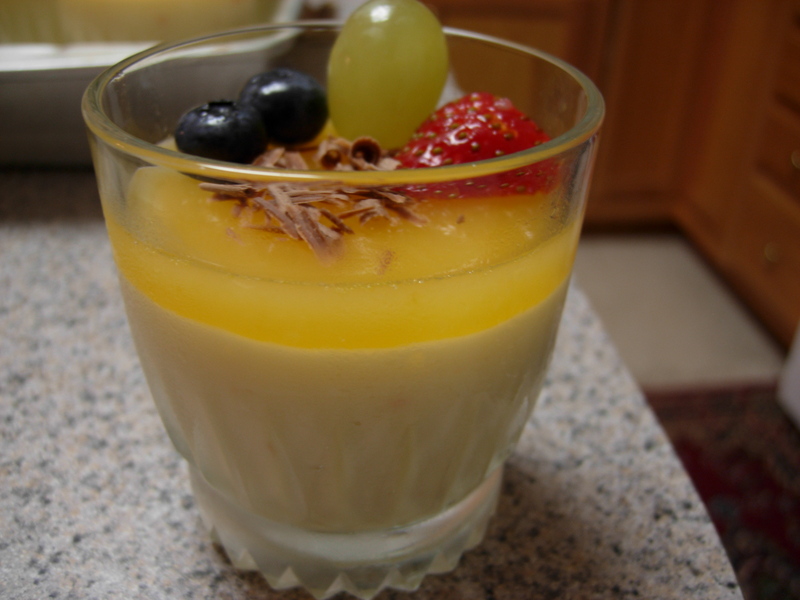 Divide the custard up into molds or cups and let chill in the refrigerator until set (2 hours or so). 1. In a small heatproof bowl, pour the cold water and sprinkle the gelatin powder on top. Let sit for 5 minutes until spongy. 2. Combine the juices and heat in a saucepan until just boiling. Remove from heat, and add to gelatin mixture, stirring to dissolve. 3. 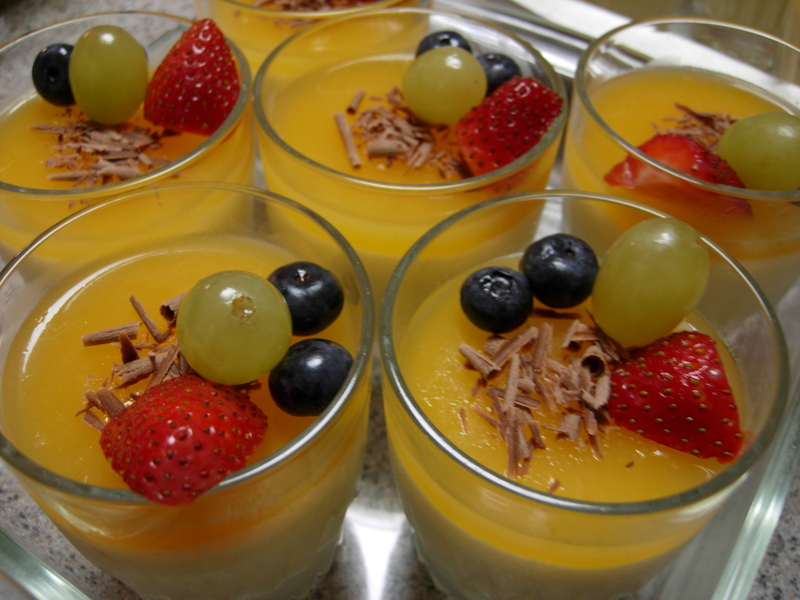 Allow mixture to cool to room temperature, and spoon a thin layer over the set bavarois. Return to fridge until set (another few hours or so). 4. Decorate with chocolate shavings, orange wedges or slices of orange rind, or fresh fruit. This entry was posted on Saturday, November 24th, 2007 at 7:24 am	and posted in baking, desserts, French, fruit and nuts, Uncategorized. You can follow any responses to this entry through the RSS 2.0 feed. Looks gorgeous… sorry Turkey day was so crazy I didn't get a chance to check my blog that day to give you my recipe. Looks like you found a winner. I usually follow the same gelatin to liquid ratio that you used. Hope you had a great Thanksgiving.